As a healer or Raid Leader it’s important to keep track of the number of stacks of Deep Corruption on your raid members. That way you’ll be less likely to blow up the raid. Here is how to set it up in Vuh’do. First go to your Debuffs tab and then hit the custom button on the right side. You’ll get the panel shown above. Deep Corruption is on the dropdown menu. Don't forget to check STACKS! Don’t forget to check off “Stacks” so you can see the number of stacks of the debuff. 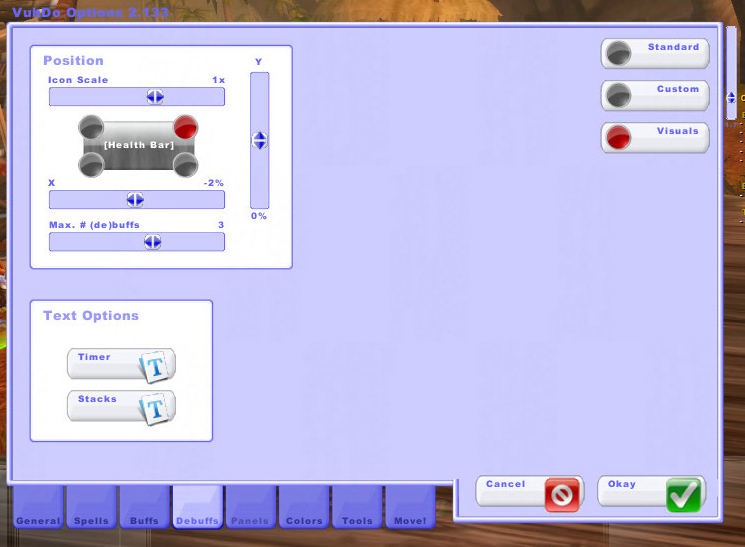 Next click on the Visuals button on the left to get the panel shown above. This panel lets you set the location of the debuff indicator as well as its size. I’m putting it on the upper right corner of the unit frame. « From the Ashes Needs You!! !